I didn’t realize the story of the little stitches that hold Amish quilts together could be so interesting. Thanks to Janneken Smucker’s post today, I now do. I hope you enjoy her concise look at quilt stitching including the importance of consistency, the 1980s “Quilters War”, and how much it costs to hire an Amish person to do these stitches. In the comments to my most recent post about Amish quilt innovators, a reader asked about finding Amish quilters to hand quilt a finished top. “Quilting” is the small stitches that hold together the three layers of a quilt—the decorative top, the inner batting (usually either a commercially available cotton bat or polyester bat), and the back or lining. Quilting detail, Center Diamond, early 20th century. Quilting stitches can vary quite a bit. Once, an Amish proprietor of a quilt shop in Lancaster County told me that quilting is like a signature. Each person’s is different. For that reason, some Amish quilt businesses prefer that only one quilter do all the stitching on a quilt, so it has a consistent feel. Some quilters can make stitches quite small. 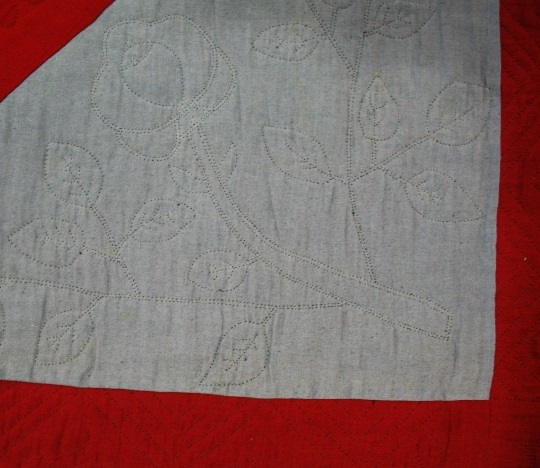 On some Amish quilts from early in the twentieth century, the stitches are around 14 per inch. Quality stitching today is around 8 stitches per inch, with more expert quilters consistently quilting around 10 stitches per inch. Typically, Amish quilt businesses charge for quilting by the yard of thread used. This has been the standard for decades. In the mid-1980s, quilters in Lancaster County earned 35 to 40 cents per yard of thread used. This rate rose to 50 cents a yard or more in the 1990s. In the late 1980s, a journalist in Lancaster County referred to a “Quilters War” in which proprietors tried to employ the best local quilters by offering a few cents more per yard. Some businesses advertised for quilters in The Budget, posting their going rate. Today, the going rate is over a dollar per yard. 1987 Advertisement from the The Budget, a nationally circulated newspaper targeted at Amish readers. Amish hand quilters compete with the growing longarm quilting industry today. Instead of hiring hand quilters, many consumers with tops to quilt hire quilters with industrial strength quilting machines to complete the laborious stitches holding the layers of quilt together. I have yet to see an Amish woman retrofit one of these for use in an Amish home. Longarm Quilting Machine with Quilt on Frame. Wikimedia Commons. I wish I could do 10 stitches to the inch! As a quilter, I would love to be able to do 10 stitches to the inch. Mine are a little fewer than that. I had heard Amish women charged by the spool of thread needed, so I assume it’s same as by the yard. 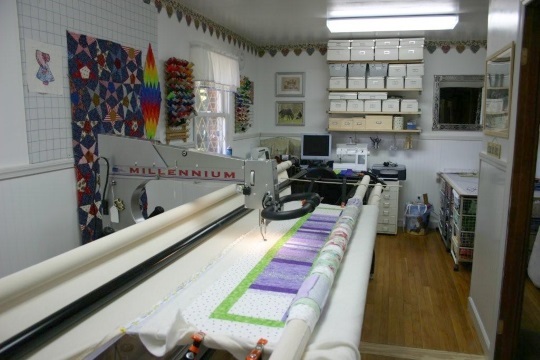 The comment about retrofitting a long arm for an Amish quilting studio is interesting. I imagine it’s coming but as long as the idea of “hand-quilted by an Amishwoman” is the selling point, it won’t happen. Long-arm quilting can be very pretty but it’s (in my opinion) impersonal. I can run my fingers over the stitches my great-grandmother put in her quilts and know her hands once touched this spot, this quilt once lay across her lap and these patterns and fabrics tell me a small part of her story. I hope my nieces and grandnieces can someday say the same when holding one of my quilts.